An incoming black hole would be invisible until it sucked material from the planets to give it a glowing accretion disk. How likely is it that a black hole could enter the Solar System? Well, you’d have to define likely; it is more likely that the Earth will get swallowed by a black hole than, say, winning the lottery ten times in a row, but less likely than being struck by lightning. In fact the odds of a black hole devouring our planet are estimated at one in a trillion. There are two predominant types of black hole in the universe. The first are supermassive black holes found churning at the centre of galaxies. These don’t really pose any threat to us, until our galaxy collides with another like the Andromeda galaxy in a few billion years. The other type are interstellar black holes, those formed when a large star goes supernova. These can be just a dozen or so miles across, with one of the closest to us being Cygnus X-1 about 6,000 light-years away measuring 44 kilometres (27 miles) in diameter. If a black hole like Cygnus X-1 were to stray near the Solar System, within a light-year or so, its gravity would cause chaos. The orbits of the outer planets and comets would be significantly and possibly disastrously altered, and this would in turn threaten the orbits of the inner planets and even the Sun. However, if the black hole passed directly through the Solar System, then things get immeasurably worse. At a distance 100,000 times greater than that between Earth and the Sun, the black hole would pass through the Oort Cloud. It’s possible that this would send a large number of comets hurtling inwards towards Earth and the other planets. Aside from this influx of comets, however, things wouldn’t seem so awry at first. As the black hole made its way into the Solar System, it would be invisible to us aside from a slight gravitational lensing effect on distant stars. 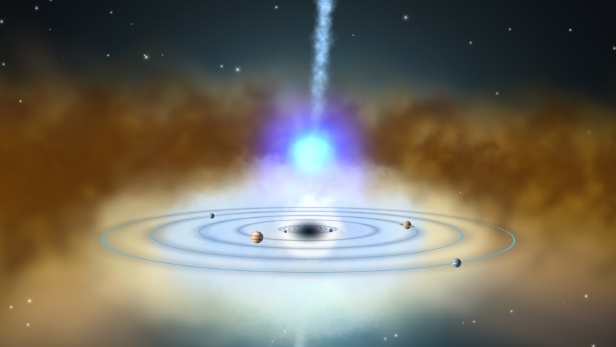 It’s not until it started to tear gas from the outer gas giant planets that a noticeable accretion disk, a region of super-heated dust and gas, would form around the black hole. Now, the terrifying power of the black hole is all too visible to us on Earth. Despite such a black hole being several thousand times smaller than any of the planets, its mass would be several thousand times greater. Thus, any planets unfortunate enough to be caught in its path would be devoured, even those as large as Jupiter. If we couldn’t see the black hole yet, we’d certainly notice the planets suddenly being torn limb from limb. By the time the black hole reached the asteroid belt between Mars and Jupiter, things would look bleak for us. The intense gravitational pull of the black hole would have torn our planet asunder, causing devastating earthquakes and supervolcanoes the likes of which humanity has never witnessed before. Upon reaching Earth’s orbit our planet is all but doomed, reduced to a smouldering uninhabitable magma-laden rock, with Mercury and Venus soon following suit. The final battle, between the black hole and the Sun, wouldn’t be quite so one-sided. A gravitational tug of war would ensue and, depending on the initial mass of the black hole, there’s a chance the Sun could survive in some shape or form. Unfortunately, the most likely scenario is that, like the planets, the Sun is ripped apart and joins the planets in the swirling mass of super-heated dust and gas roaring around the black hole. This accretion disk would extend hundreds of thousands or perhaps millions of miles from the relatively tiny black hole at its centre, replacing our Solar System with a circular inferno of the dead inhabitants it once housed. It’s fortunate, then, that the likelihood of this whole situation occurring is pretty minimal. If you do happen to win the lottery ten times in a row, though, then please let us know so we can duly begin to panic.